you may have noticed the art topping off 4 of the last 5 issues is "familiar". that's because these are drawings of a few pieces from my pattern line. to me it's important to include a drawing - by hand- of the doll or item within the patterns. drawing the doll conveys more than the cover photograph, it's the way i "see" the doll- a bit more personal than a snapshot (alot more work too!). maybe some would argue that these types of dolls not are "real" art (like the finer dolls of china), but could they argue that the drawings of the dolls are NOT art? what draws the dividing line? is a portrait of a woman more so art than the woman herself? or the bowl of fruit any less beautiful than it's rendering in oil paint? i guess it's what they mean by "art imitates life". i think that art imitates art too! and back to the drawings... to me it's just my way of saying "my stuff IS art because i say so and because i know it inside and out -in fabric and in words and on paper with pencil and ink- here it is i've put everything into to this!" . well if that didn't confuse you, i hope it at least provokes some great conversations and thoughts.
" A customer came into the store sometime ago and we were discussing dolls. She had purchased a number of patterns over time, including some of yours Maria, but was afraid to try them because they looked too hard. I told her not to worry about that... primitive is not intended to be perfect. I like to choose a colour theme for flowers, what about rusts and mahoganys?? geums, sunflowers, sweet peas, iris, violas (Irish Molly is the variety to choose) and others come in these shades and they are lovely old fashioned blooms. Tall grasses such as miscanthus may create an airy, natural feel. Rising up above your mass of vegetation and flora why not have a scare-witch with a not too scary look to her - maybe use an old black umbrella to make her skirt. Alongside birdhouses hang bird cages! (have these with door closed to prevent birds from getting trapped) line cages with moss or even plant up as you would a hanging basket. What about rusting cans overflowing with herbs, mexican-style but paint the cans with homespun-style checks?! Also, no garden can be without a grotto or folly, a miniature-sized palace, fairy den, house,etc... built from local rocks and stones. Build this in one corner hidden from direct view and have a path leading to it with little clues on the way. If you have trees or some other means of fixing up a hammock - then have a homespun hammock with a scarecrow sleeping in it." Does any one know the history or story behind the kitchen witch? "I enjoy making Raggedy Ann type dolls, but quickly tire of doing the traditional raggedy-do (hair of wool yarn). My usual technique is to thread yarn through a darning needle and after one loop put a tight anchoring stitch next to it and repeat this until the head is covered. I find my fingers get tired and sore from pulling / yanking / cursing the yarn through muslin fabric. I am wondering what other ways are common to get that "full-head-of-hair" look ie wig making, sewing strips of loops, and securing yarn with button-twist cotton thread. I love the look of the traditional ann, but I hate the time-consuming method. Or am I doing it wrong in the first place?" hook the wire around the base of a rib and squeeze it tight with needle nose pliers. paint, instant-rust, or finish as desired. tip: crimped metal bows look nice on the handles. one of the earliest recognized crafts and forms of folk art is basket making. born of mother earth native americans' baskets often included rough foliage of plants like yucca, bear grass, river bed reeds, willow, rabbit brush or sumac, vines and splint. the beautiful shapes, distinctive designs were often decorated with dyes made from wild berries, roots and bark. perhaps because the need for containers and storage was immense many colonists coming to this continent were able basket makers. their techniques evolved to include those of the native americans. materials were abundant and produced a variety of shapes and sizes down thru the years. the earliest made baskets by the colonists included splint types but it was not uncommon to see reeds, grass, straw, pine needles, roots, vines, corn shucks, split and unsplit willow as well as porcupine quills used. the splint baskets tended to be of woods such as oak, ash or hickory which produced thick and irregular, flexible strips. in addition to the handles which were generally hand carved, this characteristic is useful in identification of baskets from this time. other common traits included binding with natural materials such as animal sinew, thin strips of wood and leather, hand wrought nails, and copper tacks. the use of string, thread and rattan became popular during the early 19th century. 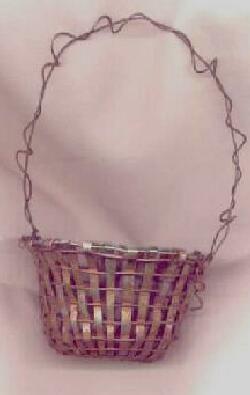 early baskets, made for use, are also identified by missing pieces, obvious wear and staining. bird-spit a wrought iron steel device with projecting prongs used for holding a bird for roasting near hearth. butterfly table a small drop leaf table with leaf supports shaped similar to a butterfly's wing. rabbit ear term applied to the upright end of chair posts which are flattened near the end of front side frequently found on ladder back chairs. another talented person i am fortunate to correspond with is pat sloan! pat is always very enthusiastic and ready to lend a hand when i need one. i always enjoy seeing the beautiful creations she comes up with in her medium of choice, quilting. seed pod: pat, please tell us about how you began quilting? pat: "It is all my friend Gwyn's fault. I thought quilting was too precise and would take too long to do, but she was sure I would like it, She encouraged me to sign up for a beginners class-I was crazy about it right away! That was over 10 years ago. I have sewn clothes since I was a kid and I have always loved fabric. Over time I really wanted to applique, but I thought that was too hard. Once I started to do applique, and found out I love that even more than piecing!! 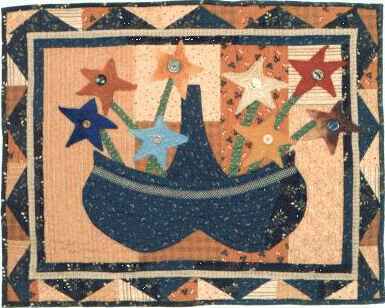 Applique has given me the freedom to do more folk art type designs. It is really the fabric that is the big pull for me in quilting. I love pattern and design, the feel of fabric and way it works into a piece." seed pod: what style do you typically work in? 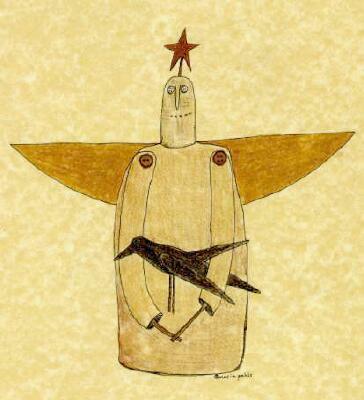 pat: "I think I work in a traditional/folk art style. I have ALWAYS been a huge fan of Red Wagon, Brannock and Patek styles. I also love all the Kindred Spirits stuff. I try to do my designs based off traditional folk art, which is a little more child like and leans towards primitive." seed pod: where do you get your inspiration for designs? 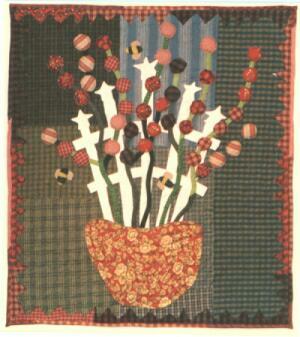 pat: "Old quilts, gardening books and country/primitive decorating magazine/books. One of my magazine series is based off a ski I saw in the window of a shop! Sometimes things just hit. I often take elements from several places and put them into one design. I'm also inspired by stories of how artists think and work. I'm really drawn to how an artist thinks about their work. Whenever I can, I read or watch stories that relate to artists (and musicians). " seed pod: on average what size are the quilts you make, how long do they usually take? pat: "I do mostly wall hanging size, because I am so impatient I want to get it done! I also have so many ideas I want to try that doing big quilts would take time away. I do a wall hanging in about a week(for those who don't quilt this is kind of fast or so my friends tell me!). I'm VERY focused when I work, so it goes quickly". 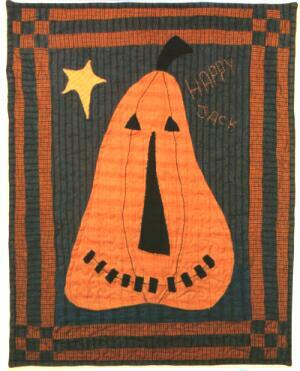 seed pod: do you collect quilts, what are your favorite types? pat: "I have a very modest quilt collection. I have 2 family utility quilts from my in-laws. (No quilt makers in my family). I also have a few other folky quilts, one is baskets and the other is a string quilt. I really like pieces that were made to use up scraps and might be considered odd. I often wonder what the quilt maker was thinking when she did it. I have also collected some old blocks that I made into quilts. I think the maker would be very happy that something was done with them!! (I finished her UFO)"
seed pod: how many patterns have you designed & tell us about your exciting news with indygo junction. pat: "I have 13 patterns, with more coming out on a regular basis I started publishing my patterns about Feb of 1998. I went to the wholesale quilt market in October of 1998 and had wonderful feedback about my quilts. This is where I meet the owner of Indygo Junction. She told me to call her if I ever wanted someone to publish for me. After market I took a look at what I was doing and what I wanted to be doing and decided to concentrate on designing. I approached Indygo and they were excited to add me to their company. I feel it will be a wonderful adventure. Indygo is very professional, has a great name that people know, and they do lots of marketing. A perfect place for my patterns to be! " I am also excited to have my own ~ called 'Pat Sloan & Co'. I hope everyone will enjoy my new pattern line which is due out in fall of 2000.
pat: "My biggest accomplishment in my personal life is having married my best friend and we will be married for 19 years in June! My husband is wonderful and supportive, I'm very lucky because not only is he great but I also have the best in-laws in the world! My mother-in-law Madge is my best friend too. I also do a little gardening, I bake (my favorite form of cooking), and I LOVE DOGS (the best animal there is!)." seed pod: how about some pointers for someone interested in starting a primitive quilt? Color - Since this audience knows about the colors of primitive work, stay with them for quilts. This would be toned down, or muddy, colors. I love mellow yellows/golds used with reds and navys. Then add in some other things for a surprise,pumpkin,blacks/beige. Pattern-If you want to piece, pick any traditional pattern. With your colors it will look old. If you want to applique go for larger shapes, things that are less detailed. You can design your own or work on a published pattern. Fabric-My favorite subject! Mix flannels in with your cottons. Use quality fabric which will give your piece a long life, and add in some that you tea dye or over dye yourself. The technique of using an over dye can completely change the fabric. I would avoid novelty prints because they will date your project in the future. Select fabrics that are time honored-plaids, small prints & florals. The shirting fabrics tea or over dye really nicely. Size- Do something small so you can work with the colors, fabrics and shapes. " includes many interesting techniques including leaf stencils, scratched onion skin eggs,african resist,gilded eggs,sgraffito (scratching),scherenschnitte(applying the cut paper to the egg) to name a few. by jessie walker and the editors of country living magazine. a country living collectibles book, inspired by the easter holiday the antique papier-mache rabbit candy container collection of enid hubbard, a northern california collector.